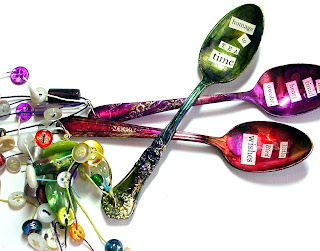 More spoons have been taking flight around my house. These are magnets for the fridge and all utilize random snips of vintage text from old readers. I've been noodling project ideas for IQF coming up in a couple of months. 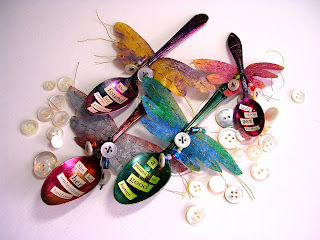 Coloring on the silver plated spoons is done with alcohol inks and the wings are made of lutradur colored with Shiva metallic paintsticks. I found some super powerful magnets at the craft store and they are awesome. Cute! Very cute! Such a clever idea. Okay...so the last comment was actually mine, but I forgot to sign in as me, rather than Jan Brattain. So now...this is my comment: Cute! Very cute! Such a clever idea, Kelli. My group just got done decorating dominoes with alcohol inks. Such a fun medium. love the addition of lutradur wings!